A bit of stuff I've been reading and thinking about. Robert Gray, one the booksellers I most respect, wrote in Shelf Awareness the other day about visions for bookstore websites. It's another insightful take on the whole issue of selling online as a bricks and mortar indie store, and what makes that work or not. Looks like Robert's got a new gig these days: working part time at The Book House in Albany, as well as continuing in the good offices of Fresh Eyes Now. It's good to count him among our ranks. "And let’s face it, a certain amount of prestige comes from working at an Indie. You work at an Indie and it says that you’re book people. You love books. You’re sacrificing for your medium. You work at a chain store doing the best job you can and chances are that once a week you’ll be asked a.) why aren’t working at the Indie in town, and b.) what are you really going to do with the rest of your life?" Hadn't thought about it from that perspective, though I feel I got the same slightly questions when I first discovered my calling as a bookseller, there is a kind of cred that goes with being a devoted Indie bookseller. But BS Chick, based on her anonymous blog alone, is one of the best booksellers I know -- devoted, smart, engaged, and willing to meet any customer's needs, not just the uber-literary ones. (I gotta admit, I'm not sure WHY she doesn't work at an indie.) Perhaps it's time we opened our minds to the possibility that good booksellers can exist within the chains (and conversely, that not every indie employee is a stellar bookseller). Book nerd talent, like truth, is wherever you find it. So I didn't make it to Void Magazine's GET LIT extravaganza last night -- exhaustion just kicked in (and is still kicking). I'd love to hear how it went if anyone made it -- it sounded like a literary jamboree worth checking out. Speaking of literary jamborees -- only 4 days until the ELNO, folks! I'm thrilled at the number of RSVPs -- our chosen venue is going to have a heck of a time accomodating us all, but that's a good thing, and there will be free books enough for all. There's always room for one more, so email me if you're interested. I do have one wonder I'd like to pose to all and sundry for your opinions. On the RSVP list I've been keeping, I noticed that publishers and literary agents outnumber booksellers nearly 10 to 1. Is that just because booksellers don't RSVP, 'cause they're spontaneous like that? Or is Thursday night too hard to get out of the store? Or is the time or place bad in some other way? Or are folks in publishing houses and agencies just more used to the idea of industry parties (like GalleyCat's "cocktail party exclusively for book publishing professionals" on the 18th)? Or are there just not as many young, committed booksellers in New York as I thought? Or...what? I'm proud of the bookstores that will be represented, and I can't wait to meet my colleagues on both sides of the sales catalog. But I'm most passionate about getting booksellers talking in community, and I'd be eager to hear any ideas about how we might be able to get more of us together. 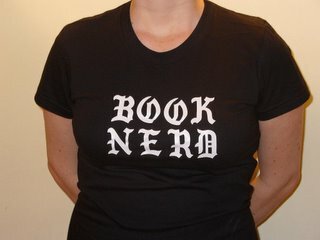 And if you're an area bookseller -- represent! The events schedule for the Brooklyn Book Festival has been posted on their website, and it looks totally fabulous. Young authors! Dead authors! Kids authors! Comics authors! Panels about hip hop, history, noir, poetry, beer, even gardening! I'm even more heartsick that I won't be able to be there -- don't miss it if you've got time to spare this Saturday. That's all for today -- I'm still precariously surfing a wave of obligations, just trying to make it through to the weekend (and the NAIBA trade show). Hope all of you are navigating books and life as well -- happy reading!